Alright, folks… after a bit of a hiatus, we are back at blogging. 2014 is a new year, which means newly engaged couples who need wedding planners! One of our favorite trends as of late is the alternative to the traditional wedding cake. We’ve come up with just a few of the sweetest dessert options for your big days. Who doesn’t like donuts? No worries about having to choose a wedding cake flavor that will appeal to everyone; opt for various flavors of these (traditionally) morning snacks. 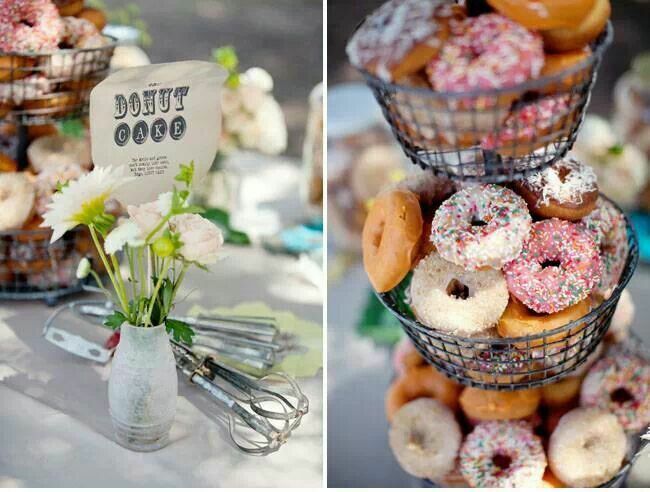 Donuts are an inexpensive way to satisfy sweet teeth. Also, there is no need for cake plates or messy cutting. These are a grab and go treat! Macaroons are an up and coming dessert in the world of weddings! These can be served in addition to a wedding cake or in place of one. The best part about these beauties is that they come in a variety of colors. Simply choose a color palette that fits into your design plan and call it a day. Finger food, at its finest. For those of you who like rustic hints, homemade pies make for rad dessert tables. Select a few family members and friends to whip up their favorite type of pie and bring it to your wedding. Use a sweet printed tablecloth to display these goodies. Make sure that there is a variety in the pies, so that they appeal to the majority of your guests. Not only are these alternatives to a large wedding cake adorable, but they are also a heck of a lot cheaper. So, if you are a bride on a budget, this may be just up your alley. What a fabulous year we've had here at Pastore Events! Thank you to all of our couples for allowing us to have a small part in your love story. Thank you to my lovely assistants Tish & Chelsea for being such hard workers. Thank you to Aleza, Amanda & Kate for assisting me throughout the year, as well. Thank you to Rob & Genevieve for allowing me to do what I love even if it means missing swim lessons and date night. Happy Holidays from Pastore Events! We are moving further and further away from traditional weddings. This means that we are moving toward more unique bridesmaid dresses. Sometimes, they are all the same color in various fabrics and, other times, they are in different hues. 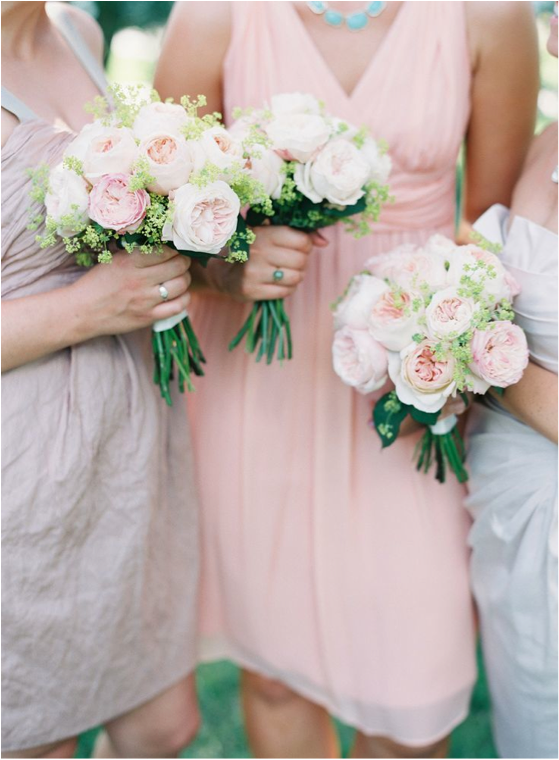 We adore the different hues used in bridesmaid dresses this season! We’ve come up with some of our top picks. While this is more of a spring/summer palette, we cannot get enough of these colors together. Pinks and beiges work well on virtually any skin tone and with all hair colors. They are classy, simple, and do not overpower the bride. If you are looking for a chic, organic look, these hues may just be the right fit. Martha Stewart has outdone herself again. While the colors of the bridesmaid dresses are pretty much the same, there is a variety in the fabrics and textures. Not only this, but we think that this is an ideal way to incorporate short and long bridesmaid dresses. Even though the champagne color is close to the bride’s dress, she still stands out with the use of feathers and a stunning headpiece. This color palette is perfect for this time of year. It is a great way to add some warmth to this colder season. 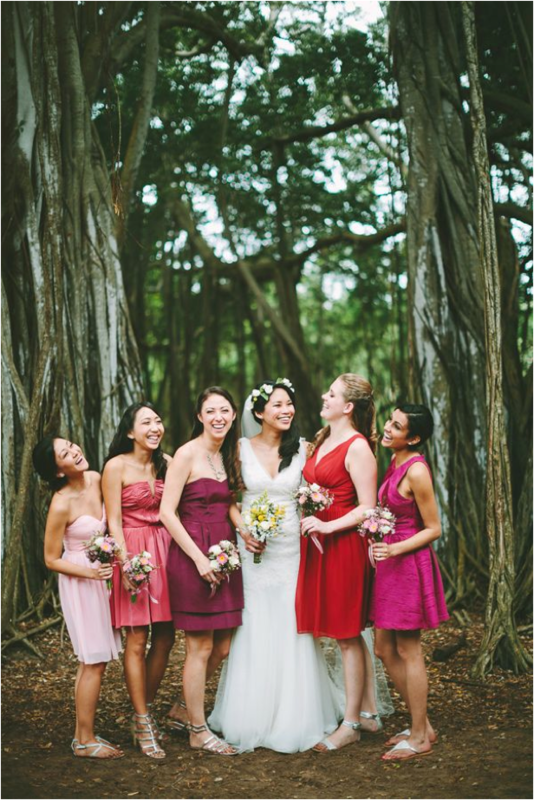 These bridesmaid dresses vary from reds to cranberries to light pinks. Even though all of the dresses are short, they are all cut differently. This works well when you are trying to fit your bridesmaids in the style that they feel most comfortable in. While opting for the same bridesmaid dresses can be absolutely gorgeous, we really do like the slight color differences that are popular right now. You can also vary the length of the dresses, the texture, and the cuts. There options for bridesmaid dresses are endless. One of the most exciting parts of getting hitched is getting to share the same last name as your loved one. What better way to celebrate this new name than thru the use of monograms throughout your wedding décor? 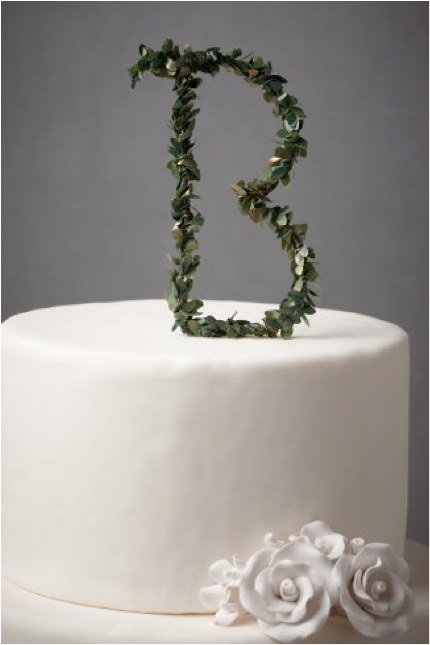 We have gathered a few of our favorite simple uses of initials on cakes and table runners. Add some texture and color to a plain wedding cake. Use something like fondant to cover the cake in order to create a smooth surface. 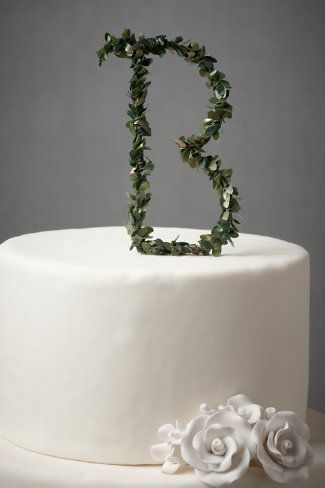 Then, contact BHLDN and order one of these sweet leafy cake toppers. Choose the initial of your new last name and show it off proudly atop your tasty treat. This runner is near perfect as it is. Linen and stripes is a classic pair; this table covering is made even more hip with the embroidered monograms on it. This is a great idea to show the joining of your love; the shared last name initial goes in the middle and the first initials of the couples’ first names go on either side. Super cute, if you ask us. This is similar to our first option except instead of using your letter as a cake topper, it is directly on the cake. Have your cake artist design something that is modern and that will show off your new last name. We like that this couple chose to have a faint border drawn around their “g.” This cake balances femininity and simplicity in an ideal fashion. Girls, be honest… you have always wondered what your last name would end up being. Your wedding day is the best way to show off your new name. Find pretty, small ways to incorporate your initial(s) into your decorations.